Sean Dyche ‘saw flashes of encouragement’ from loan signing Georges-Kevin Nkoudou after the French winger made his debut from the bench at Selhurst Park. 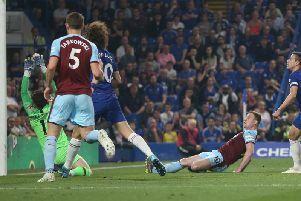 The Burnley boss is confident that the 22-year-old will be a useful addition to the squad once he digests how the team operates and adapts to the culture of the club. Dyche was pleased with the glimpses of quality on show once the Spurs man replaced Jeff Hendrick after the hour against Crystal Palace but is adamant that there’s more to come. “There were flashes of encouragement, definitely,” he said. “He has to learn how we operate obviously, he hasn’t played a lot of football and he’s only been with us a couple of days. “I think he’ll add to that the more he gets used to us and what we’re about, but there were certainly flashes. “At the end he broke through and nearly found the pass which makes the difference, the one for Johann when he nearly has a chance and it just goes behind him as he breaks down the line.